Being a designer isn’t all fun and games. But INSTALL DAY? Well, that, my friends, is the VERY BEST part of what I do. All the planning, designing, shopping, sourcing, ordering, returning, reordering, texting, packing, loading, and scheduling is done, and the rubber FINALLY meets the road. I get to arrive in the client’s home, send them off for the day, and get down to the fun part. Pulling the entire look together! Yesterday was a heckuva fun “Install Day.” This particular job was a living room AND a family room (Bonus! 2 beautiful rooms to complete, just steps away from one another!). 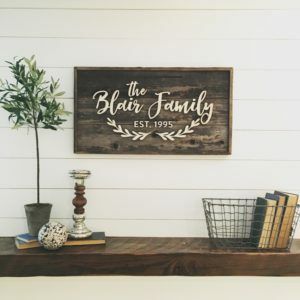 I thought it might be fun to share a few before & after shots, and a couple fun details from the day because, hey…maybe you’re looking for ideas in a similar space! Let’s start with the Living Room…the first room you see when you enter this sweet family’s home. One of their initial complaints was that it felt dark, but their wall color connects to a few other areas of the house…so a change in paint would affect several other areas in close proximity. No problem. The wall color was/is a nice neutral latte color…a great foundation for our new look! 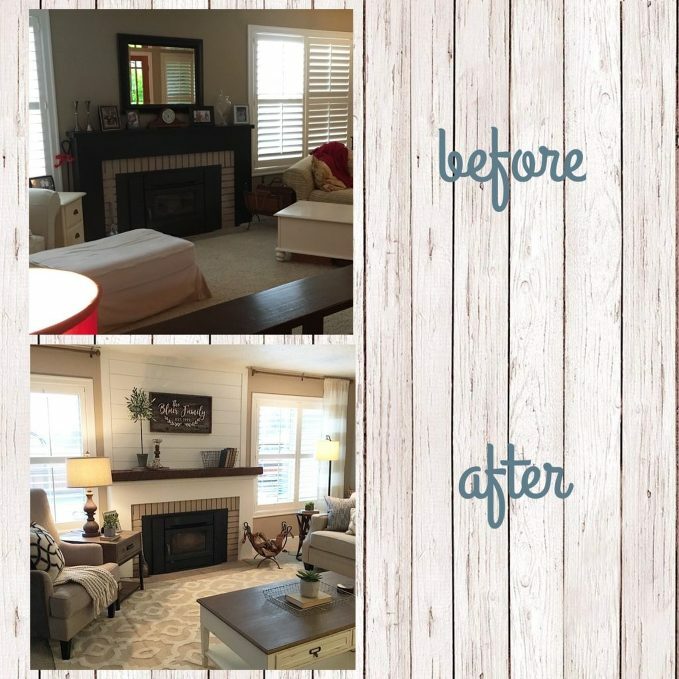 We discussed painting the fireplace at the consultation, but these clients get MAJOR extra credit for installing shiplap and adding a gorgeous reclaimed mantel! What an amazing addition! It really helps create a beautiful focal point and draws your eye when you enter the home. Here’s a little peak at the other side of the room…be sure to notice the red gingham sofa on the far left side of the “before” pic. The homeowner really loved this piece (it’s so comfy! ), so we gave it a fresh new life in the family room…you’ll see in a minute! Here’s the view from the entry hall. Gosh, I just love this room. It really “goes” with the amazing family that lives here. Love it when that happens. Oh, how I wish you could see this in real life. Before, the dark furniture was comfy, but it was dragging the room down. Remember that red gingham sofa that was in the living room? I must admit, I was a little smitten with it the first time I saw it. Charming with a capital C! It became our inspiration for the room…sort of a “Cottage Cozy” look. The clients purchased the other slipcovered sofa & chair at Ikea, which were similar in style to the gingham sofa…just perfect. The VERY soft rug (you can find it here!) pulled the whole thing together. Here’s another angle, before & after. And that sofa? It has my heart! The darling dotted pillows are from Target (CUTEST pillows EVER) and the amazing “gather here” pillow is from With Lavender and Grace. I adore the light-blocking window treatments (find them here) and this perfectly rustic coffee table (find it here)! The other pillows were fun finds from HomeGoods & Ikea, and the cute little white round side table was formerly used in the front living room…perfect for our cottage family room! This amazing white sofa table was already in the room, but it was dark wood. On consultation day, I asked the client if she would be willing to paint it. She did a beautiful job, and she was brave to let me distress it, after all of her hard work. The end result is so fresh! Friends. The BEST part of the whole day was when the homeowners came home for their reveal. They blessed me with their reaction, their kind words, and the look in their eyes. I saw them see their home in a completely new way. And THAT’S what it’s all about. So happy to know this sweet family will enjoy their “new” spaces for years to come, and I’m so thankful to have been invited along on part of their journey! Lisa - The rooms look so beautiful!!! Love the choices! 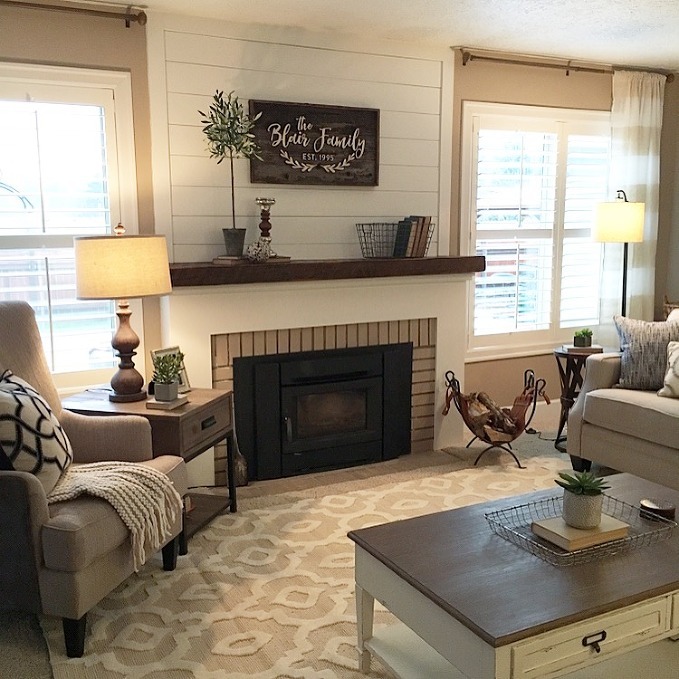 Do you have a source to share for the lattice area rug in the first room? It is exactly what I am looking for! Mallory - Do you mind sharing if the IKEA furniture is white or is it a beige?